For safe driving, adjust the seat and mirror to an appropriate position before driving. Adjust the angle of the seatback so that you are sitting straight up and so that you do not have to lean forward to steer. Adjust the seat so that you can depress the pedals fully and so that your arms bend slightly at the elbow when gripping the steering wheel. Lock the head restraint in place with the center of the head restraint closest to the top of your ears. Wear the seat belt correctly. Make sure that all occupants are wearing their seat belts before driving the vehicle. Use a child restraint system appropriate for the child until the child becomes large enough to properly wear the vehicle��s seat belt. Make sure that you can see backward clearly by adjusting the inside and outside rear view mirrors properly. Failure to do so may result in death or serious injury. Do not adjust the position of the driver's seat while driving. Do not place a cushion between the driver or passenger and the seatback. 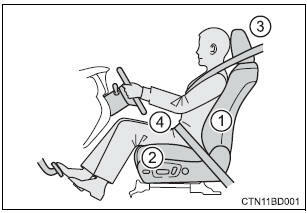 A cushion may prevent correct posture from being achieved, and reduce the effectiveness of the seat belt and head restraint. Do not place anything under the front seats. Objects placed under the front seats may become jammed in the seat tracks and stop the seat from locking in place. This may lead to an accident and the adjustment mechanism may also be damaged. When driving over long distances, take regular breaks before you start to feel tired. Also, if you feel tired or sleepy while driving, do not force yourself to continue driving and take a break immediately.